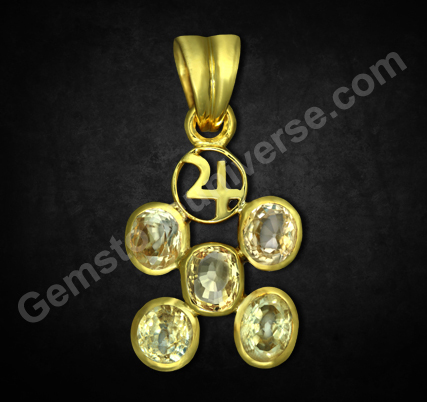 Wisdom, Good fortune, wealth and knowledge the blessings of Jupiter in this Yellow Sapphire pendant. 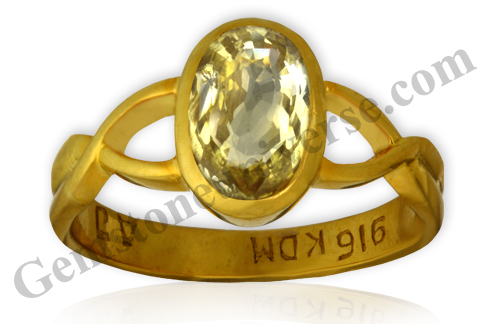 Eye clean, amazing rich canary yellow colored, yellow sapphire from Ratnapura in Sri Lanka, set in 22 K gold, to harness the benevolent Jupiter energies. 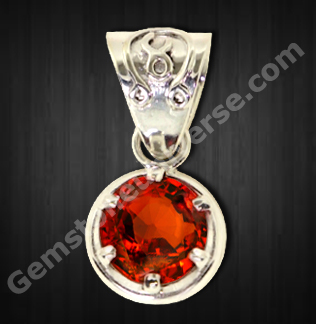 The amazing colour and clarity in the gem make it a very powerful and auspicious talisman for Brihaspati/ Jupiter – the dev guru. 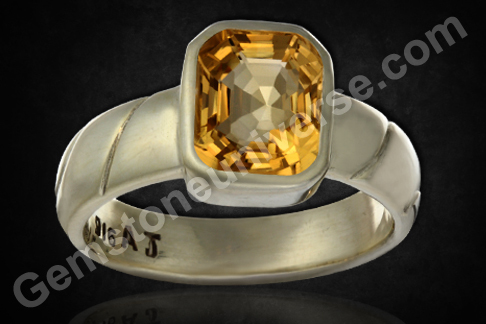 This unheated yellow sapphire has a mesmerizing aura and an alluring color which is hard to come by in a natural gem. 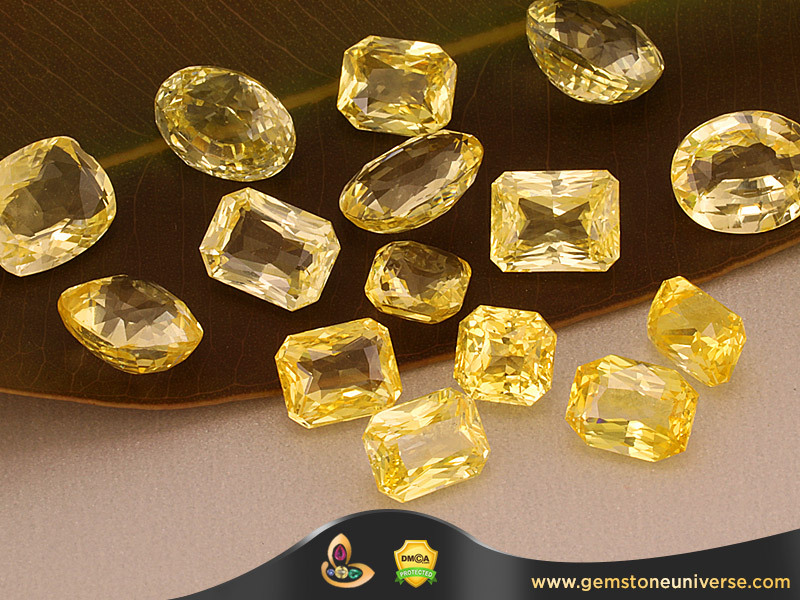 Most yellow sapphires available in the open markets today have undergone heat treatment. 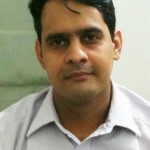 But not our jyotish gems! Mined from the nature’s womb, cut and fashioned with utmost care and precision, this yellow sapphire is part of the rough (unprocessed raw gem mineral) owned by Gemstoneuniverse! 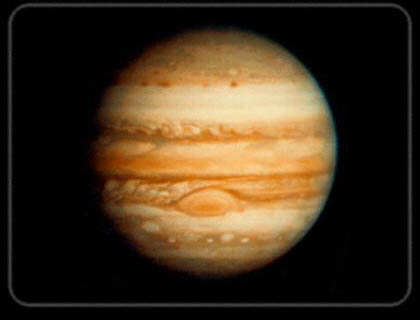 Jupiter is one planet that rarely shows adverse effects for an individual. 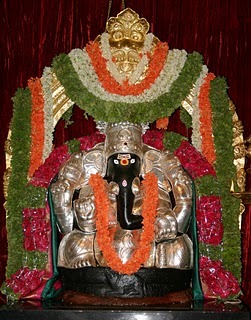 However, if grace and benevolence is showered, it can affect miraculous turnaround in fortune of individuals. 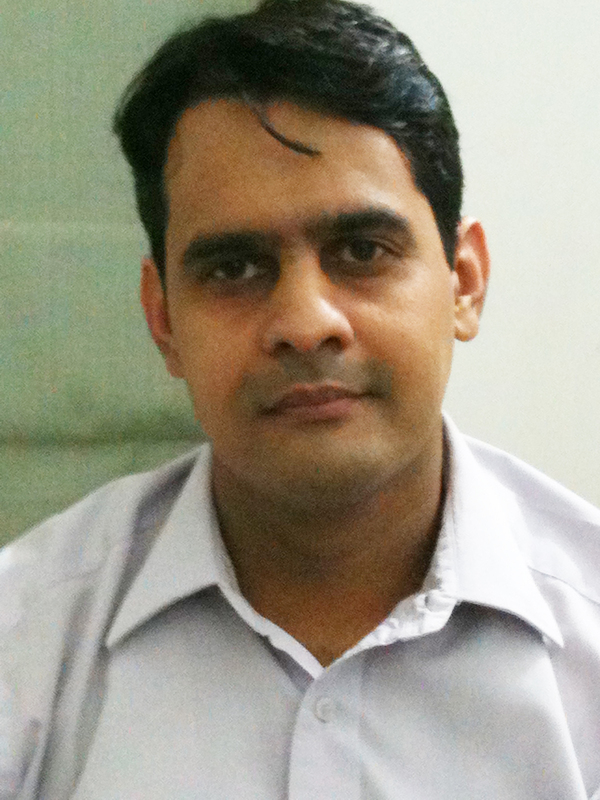 Popularly known as pukhraj/ pushyarag, the gem harnessed the golden–yellow divine energies of Jupiter. 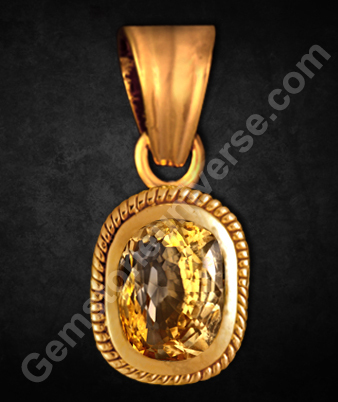 Comments A beautiful Cat’s eye chrysoberyl, gem of Ketu or Dragon’s anti-node set in silver. Note that the planet Ketu’s planetary symbol stands in relief on the shank. 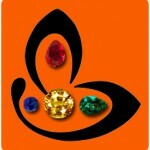 A powerful talisman, made out of a powerful gem. 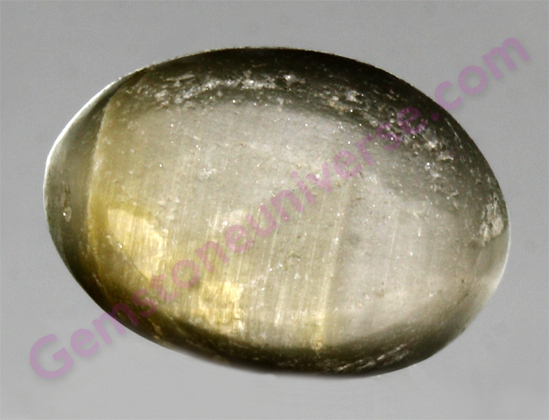 The cat’s eye chrysoberyl in question is a lovely pale green tinged with honey color. What makes it really special are the two stunningly vivid chatoyant bands that are pure white in color. The white bands open and close beautifully, giving the best display of chatoyant behaviour, which gives the overall cat’s eye effect in the gemstone. Mystical and mysterious Ketu energies abound in this talisman and carry the promise of working a miracle. Nature’s bounty, in a tiny packet, this cat’s eye talisman! 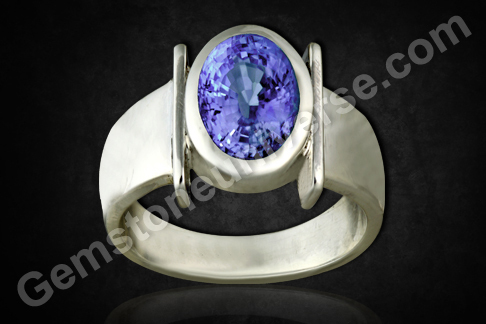 Velvety medium Cornflower Blue color, one of the most cherished colors for Blue Sapphires! 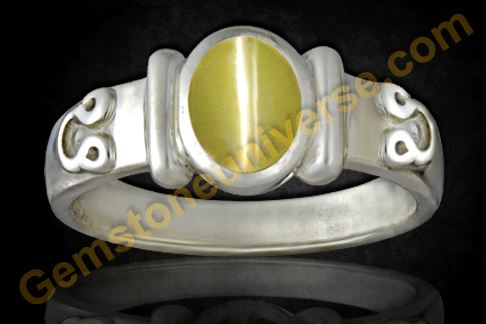 Neelam Ring for Lord Shani-Vedic Talisman. Comments The Cornflower Blue color of the Kashmir mines, where mining stopped in the early 1920s, is the color that is most preferred by gem connoisseurs, not only because the color is most pleasing but also for its velvety appearance! 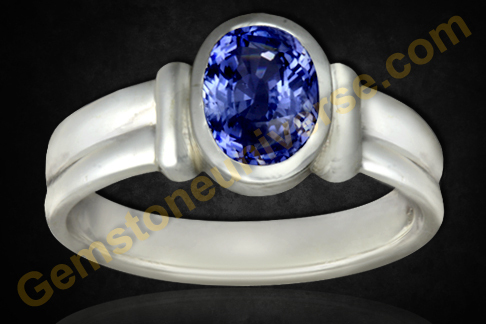 This fully natural and unheated Blue Sapphire from Ceylon/Sri Lanka has in it a color extremely close to that very color! 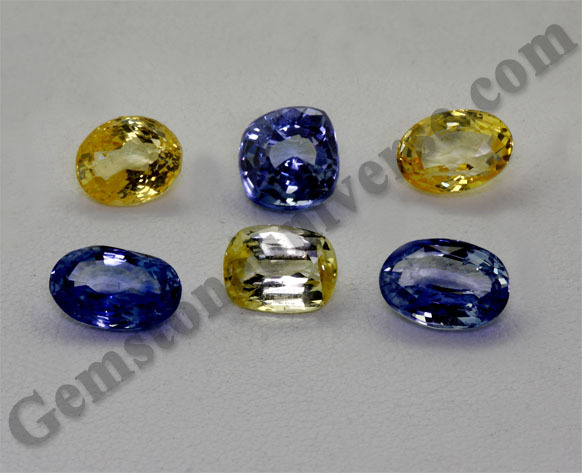 And clarity rarely seen in untreated Sapphires! With a potent and Sattvik presence this gemstone when set in this sterling silver ring is all set to deliver the best and powerful Jyotish results of the planet that is considered as one of the most powerful planets – Saturn!